The Latronics LS Series Stand-alone inverters are powerful, reliable and utilise advanced microprocessor algorithms to ensure your power conversion is pure and stable. 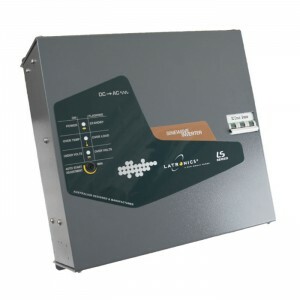 Share the post "Latronics Inverter 24VDC 2300W"
A wall mount design allows flexibility and ease of installation. A true sinewave output with excellent surge power capacity enables the operation of demanding appliances, such as fridges, microwaves, washing machines and pumps. Pure sinewave output provides the ideal power source for modern electronics. Robust design that protects itself against AC shorts. 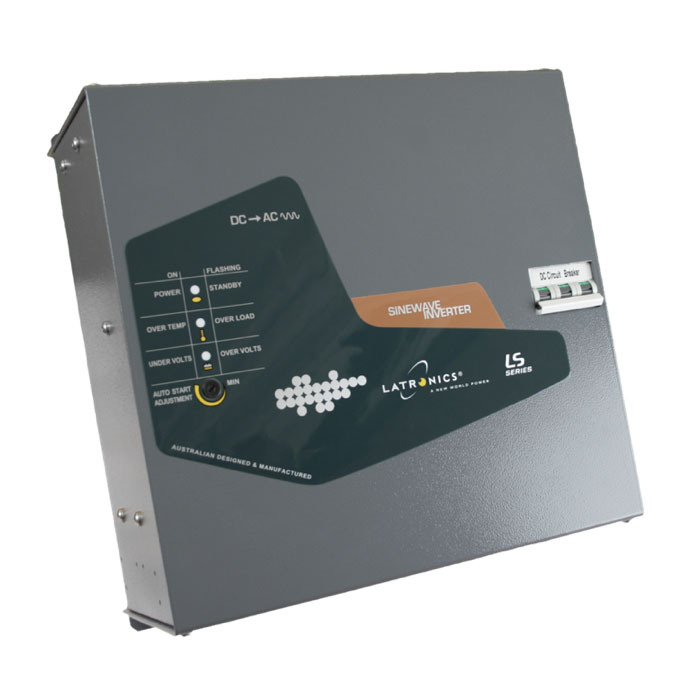 Latronics LS Series Stand-alone inverters are backed by our manufacturer’s warranty: two years for 500W-1800W models and three years for 2000W-7000W models. Sophisticated circuitry provides protection against overload, short circuit, over temperature and battery low voltage shutdowns. Fully selectable between 50/60Hz via a set of internal dip switches for international use. 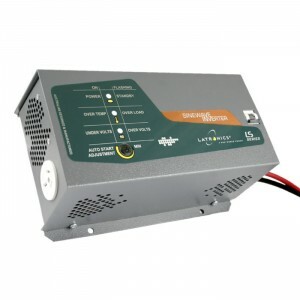 Auto-start circuitry automatically switches the inverter ON and OFF with applied appliances. The auto-start is an important feature as it maximises valuable battery capacity. Sensitivity of the auto-start can be easily adjusted to either start small appliances or run continuously. 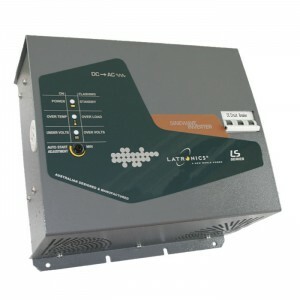 Latronics LS Series inverters are a quality industrial product customisable to withstand vibration and constant movement in mobile or marine installations, as well as the diverse range of home or commercial applications. Latronics LS Series inverters are built for extreme environments using a recyclable powder coated aluminium casing. Toroidal transformers provide outstanding efficiency and durability. When sized correctly, our high surge rating allows easy starting of motors and high inrush current devices. DC Circuit Breaker protects the inverter and cables from becoming a potential fire hazard under fault conditions, as well as providing isolation from your batteries while switched OFF. The circuit breaker is designed for ease of operation and safety. If the Inverter shuts down due to Overload, Undervolts or Overvolts it can be reset. Full 3500V AC/DC isolation. High quality, high current, heavy duty DC leads for low loss power delivery. Simple at-a-glance LED lights keep the user informed of its status at all times. A large range of options from custom voltages and alarm contacts to vibration proofing and conformal coatings are available.